The energy efficiency legislation for new buildings, SANS 10400-XA, has been published by the regulator (NRCS). All new buildings will have to comply with the performance parameters. This means that insulation will have to be installed to achieve the stipulated R-values. Each climatic zone has different R-value requirements for certain walls and ceilings. 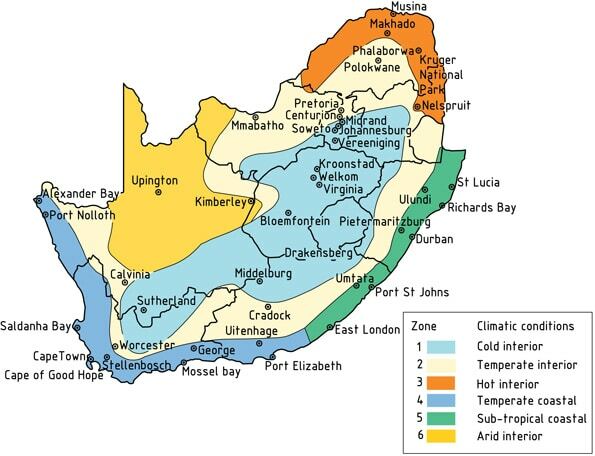 The appropriate thickness and R-value of insulation for your climatic zone, correctly installed, will protect your home against the cold, heat and save electricity providing a comfortable, healthy, safe and quiet space for you and your family. Maximum Energy Demand for Buildings – Roof Insulation and Hot Water Insulation is Essential to Meet These Standards. The maximum demand for buildings such as Entertainment and public assembly, theatrical and indoor sport, places of instruction, worship, large shop, offices, and hotels. 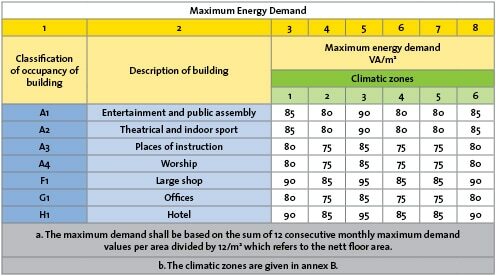 The maximum demand shall be based on the sum of 12 consecutive monthly maximum demand values per area divided by 12/square meter, which refers to the nett floor area. Roof insulation can assist in meeting these maximum energy demand requirements. 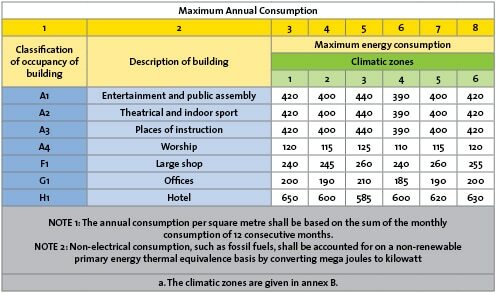 Note 1: The annual consumption per square metre shall be based on the sum of the monthly consumption of 12 consecutive months. Note 2: Non-electrical consumption, such as fossil fuels, shall be accounted for on a non-renewable primary energy thermal equivalence basis by converting mega joules to kilowatt. 4.1.4 Solar water heating systems shall comply with SANS 1307, SANS 10106 and SANS 10254 based on the thermal performance determined in accordance with the requirements of SANS 6211-1 and SANS 6211-2. 4.1.5 All exposed hot water service pipes (SANS 10252-1) shall be clad with insulation with a minimum R-value in accordance with SANS 204. 4.1.6 Thermal insulation, if any, shall be installed in accordance with the manufacturer’s instructions.